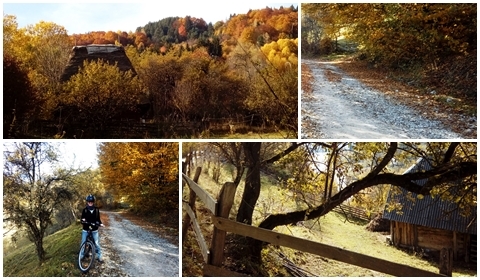 ON A BEAUTIFUL, SUNNY morning in mid-October, my boyfriend and I decided to go on a spur-of-the-moment cycling adventure. 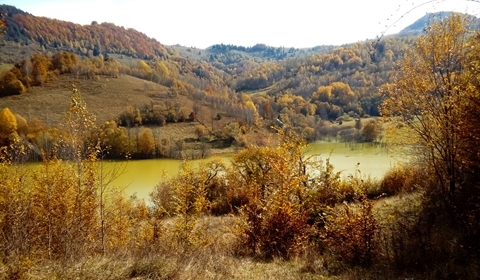 We packed up the bikes and headed toward Geamăna Lake in the Apuseni Mountains, about a two-hour drive from our city of Cluj-Napoca, Romania. 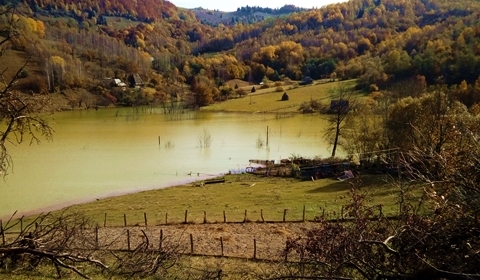 Until the late 1970s, Geamăna was a thriving village in the valley of Șesei. 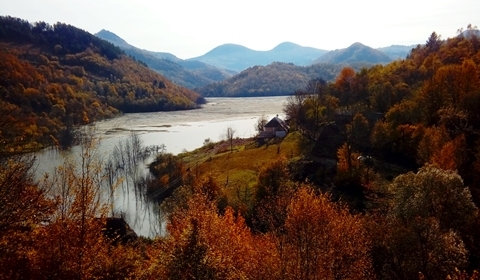 Then the Communist regime relocated the villagers to make way for dumping waste-water from nearby copper and gold mines. 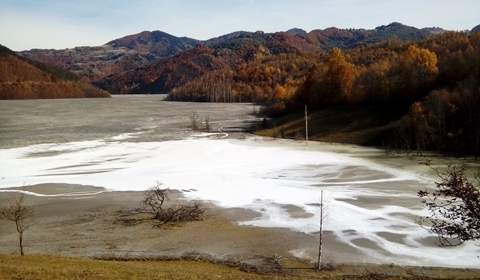 Geamăna is now a lake of cyanide and other chemicals. The toxic dump is so bad it covers the surface of the village. 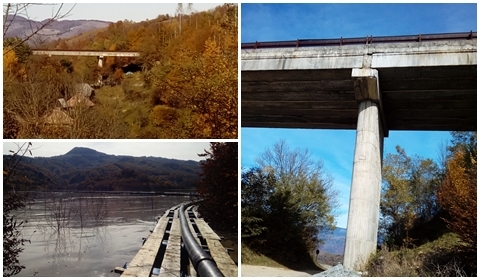 You can still see pipes carrying materials to neutralize the toxic waste, and hear it spilling it into the lake. We rode alongside some of them. In the lake one can see how the waste-water bubbles up in some places. 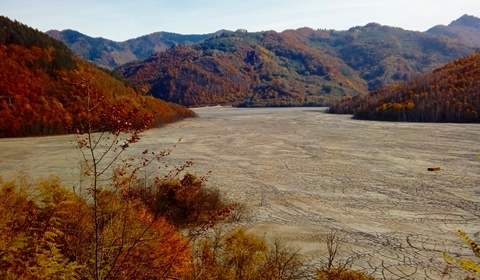 It leads to the scary realization that Romania is incapable of maintaining a high environmental standard. 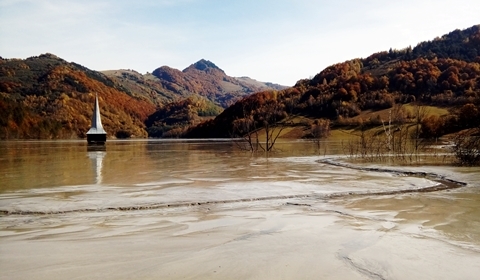 We had actually tried going to Geamăna Lake once before on the way home from a different road trip. When we got to the foot of the hills, we found that the only access to the lake was a dirt road. We decided it probably wasn’t a good idea to wreck our car. We stick by the thought that a 4×4 is the most suitable vehicle for this type of road. We arrived in the commune of Lupșa, parked our car near its church and got our bikes ready for the ride. Looking at Google Maps, we decided which route to take. I turned on Ride Recording on Strava—the app I use to track my runs, cycling, ice skating and other sports activities—and we headed toward the lake. The plan before we left home was to cycle around the lake. 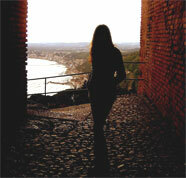 Once we started up the hill though, we quickly realized that wouldn’t be a good idea. Not that day. After not having taken our bikes out for about a month prior, we were a bit out of shape. I was also getting over a cold from the week before. This meant we needed to stop several times, adding a lot of rest time to our 2.5 hours of moving time. Although we only got to a maximum of 794 meters high, we had to push our bikes up the hill a few times because of how steep the 501-meter elevation gain was. We got to the lake late, around 11AM. An early start would have been better. It gets dark very early in the mountains during fall. The ride, as tough as it seemed to us, was absolutely beautiful and worth all the effort! 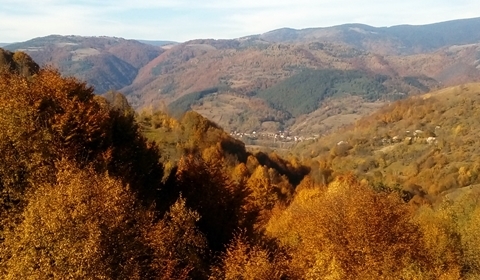 Fall colors greeted us everywhere we looked and the commune of Lupșa from the foot of the hills looked spectacular in the soft sunlight. Given its nature, I won’t say the lake itself is beautiful. However, I have to admit this lake is very interesting and highly different scenery than anything I’d seen before. We saw remnants of an old barn, and the old village church tower peeking out from the waste. These buildings were located higher on the hills of the old village, so the toxic waste hasn’t completely covered them yet. There may be more such buildings still above the “water,” but not up to where we finally turned around to head back to the car. 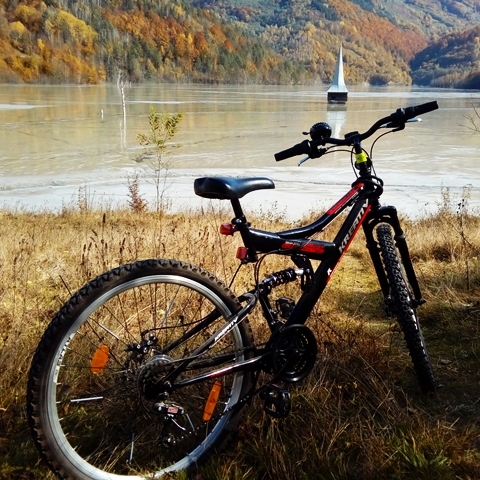 Years ago a work colleague sent me the link to a picture of a bike with the lake all colorful and the church tower in the background. Ever since then I’d wanted to see this place. Back then I didn’t think I’d actually get there riding a bike—which made this little trip special. We didn’t reach that specific spot I saw in the picture, but I did manage to take my own pictures of our bikes with the same background on a different side of the lake. Even though the houses were high up on the hills of the old village, one can see how the waste-water is slowly but surely creeping over fence lines, taking over people’s gardens and any sheds or other buildings at the far ends of their properties. What most surprised us is that people still live near the lake. Very near. 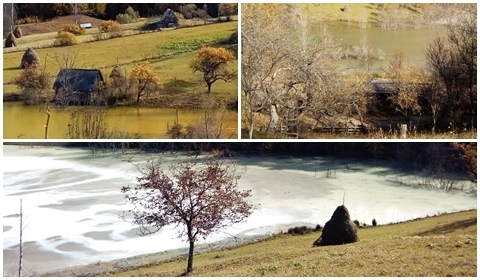 We saw an old woman working in her vegetable patch just meters from the “water,” and hay stacked right near the lake. We still wonder how those people are able to live there, and why they didn’t leave in the first place. 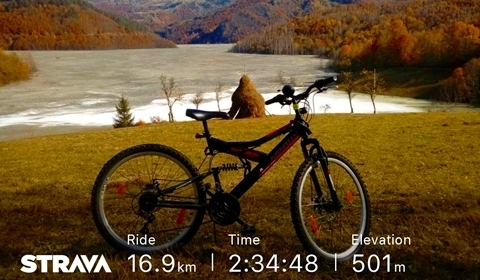 We were sad to give up on cycling around the whole lake, but not knowing the path and with it getting dark soon, we headed back toward Lupșa at around 4PM. The ride back was definitely easier as it was mostly downhill. We were pretty beat from a total of five hours and 16,9 kilometers of cycling, but we’re determined to go back for another cycling adventure during summer—this time all the way around the lake! 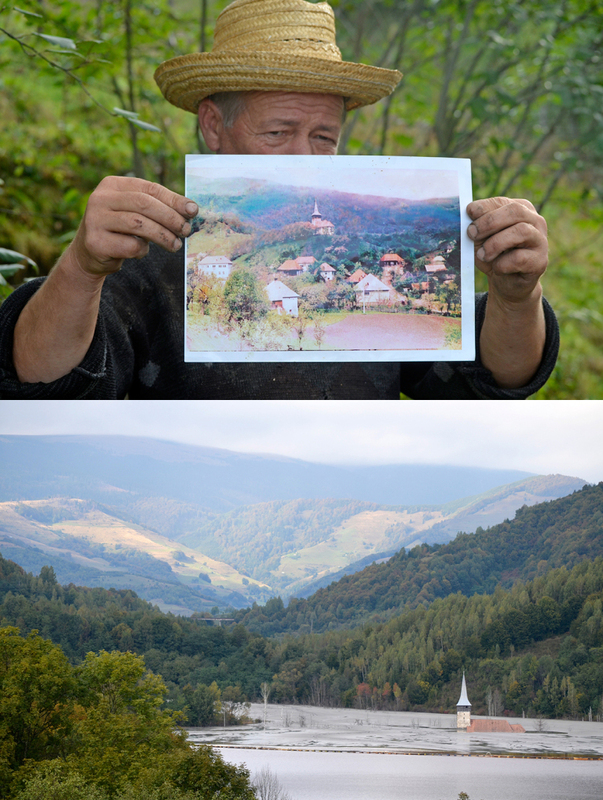 I found this picture by Adrian Ciubotaru taken during his visit to Geamăna Lake some years ago, where a local showed him a picture of what the village used to look like before the flood of toxic waste swallowed it. Notice how in his picture one can still see part of the church’s rooftop, which these days you can’t see anymore.